Hello Coding released! Get 17 courses for $49. Introducing our latest massive project: Hello Coding. It took 5 months, and it’s here! Featuring 164 hours of curriculum and 17 bonus courses, it’s on sale now for $49. We’ve gotten great feedback from our Kickstarter backers, who received early access to this course because they helped us raise over $100’000. 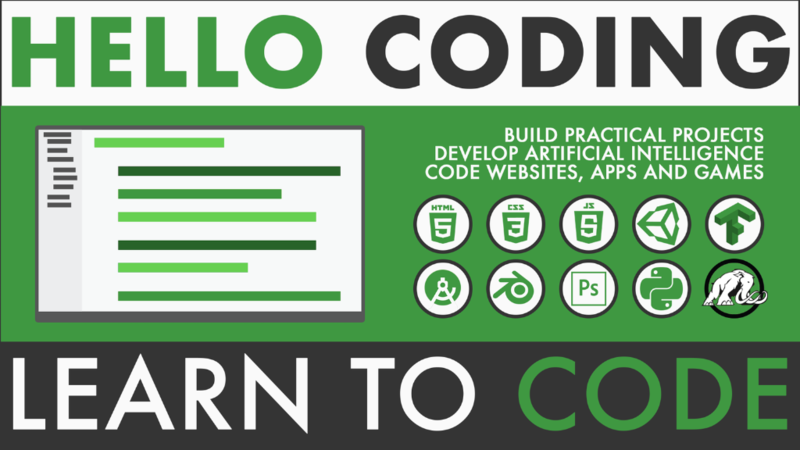 Hello Coding takes you through 5 stages of development: introduction to coding, web development, app development, game development and artificial intelligence. This final part is our favorite – you get to learn Python, TensorFlow, stock prediction, image recognition, fraud detection and more! 164 hours and 17 bonus courses. Get all Mammoth Interactive courses at a discount. How to get extra content. We have 5 days to go! Please share this Kickstarter. The more funding we get, the more topics we can add. We are still adding stretch goals per every 1000 dollars we raise. Please spread the word about Hello Coding. Do you know someone who’s always wanted to learn to code but doesn’t know where to start? Tell them about Hello Coding! We’re always happy to answer any questions. By pledging to this Kickstarter, you get our courses at an extremely discounted price. We encourage you to take advantage of our offers while they’re still open. We will be adding a ton of BONUS topics to Hello Coding depending on the funding we raise. Please note that the stretch goals will end at $200,000 raised. That would give you 200 stretch goals to enjoy. Check out all the extra topics we’ve added so far! Each one will be part of Hello Coding in addition to the 5 levels. $11,000 – Build a Virtual Reality shopping website. $12,000 – Build a 3D logo in Virtual Reality. $19,000 – How to start a business from scratch. $20,000 – Email marketing 101. Build your list! $27,000 – Build a classic CastleMainia game in Unity. $29,000 – Build a classic Double Dragoon clone in Unity2D. $33,000 – Build a Bootstrap website. $36,000 – Introduction to stock trading for self-employed freelancers. More stretch goals (hopefully) coming, depending on how much we can fund in these last 5 days!